After carefully researching and physically inspecting portable storage units in the marketplace I decided to purchase BOS container units. The units are well built and designed, easy to construct and offer size flexibility as units can be "linked" together. Kari knows the ins and outs of the product as well as the logistics of getting the product to your doorstep from the factory in Germany. Kari provides excellent and quick old fashioned service you rarely see today. The recently purchased units have been well received by the market and we will be doing business with BOS in the future. "After an extensive search for the right solution for our storage requirements at the SFO airport, we were delighted to have found a product, which solved the need for a more secure, lockable space. As soon as we contacted BOS Container USA, they walked us through the process of ordering a product meeting our needs with a selection of important accessories (shelving systems, sky-light, access ramps, anti-condensation coating, connection kit). The ordering process was smooth, and updates on manufacturing and delivery were frequent. This was extremely helpful since it was not a familiar product to us until then. Their services exceeded our expectations extending to their invaluable help in the assembly process at SFO which was efficient and fast in spite of the tight space available to mount the storage boxes at our end. I highly recommend their products and services, and would not hesitate purchasing another unit or product from BOS to solve another storage or space issue whenever that occur." "My experience working with your Metal Containers has been exceptional. The ease of breaking down and resetting up has allowed me to move them around quickly and easily on my job site and send them to other sites when completed. The space inside the units worked well for our onsite secured storage. I would not only recommend the use of your containers to others but would not hesitate to purchase additional units when the time comes." We live in Brooklyn, NY in a neighborhood of small houses. The property is not quite 20’ wide. When our rusted garage had to be taken down, both Stuart and I knew that we wanted to replace it with a steel container. Many great advantages: secure storage, flat roof (I’ll get to that again), sleek dimensions and the fact that it would just be so cool to have a container. We rejected the ones from the big-box stores. We researched used shipping containers, but quickly realized that there would not be any way it could be delivered. The space between the houses was too narrow for the width of the container and the one-way street was too narrow for the truck to make the turn to back it onto our property. We considered booming it over the fence, but thought that was a bit over-the-top, so to say. More research led us to flat-pack steel containers, but wanted to check them out before committing to buy one. We were quite excited to find the BOS Container USA had an area code in Westchester, NY, which is an easy drive from Brooklyn. While they are no longer located in NY, our contact, Kari Honkaniemi, CEO for BOS USA, directed every detail of the purchase… and more. He arranged for us to inspect a BOS container on a construction site in lower Manhattan. The burly foreman with an Irish lilt met Stu at the gate and asked him if he was the one that wanted to see “the shanty”. While we didn’t need to move our container around our property by chains and cranes the way they did on the site, the container was perfect in size and build. Kari then arranged for Stu to check out a used container for sale in Perth Amboy, NJ. When that one didn’t work out, he arranged for us to get another one that was stored in a warehouse in Newark. Stu and our son’s friend Joshua rented a truck, picked up the flat-pack in NJ and then dollied the individual pieces from the truck into the backyard. And when Kari made arrangements during a short trip to NYC to come to Brooklyn to help put up the container, we knew we had a winner. Kari, Stu and I erected the container in under an hour and spent the rest of the morning pleasantly chatting over bagels and whitefish salad, which are a Brooklyn staple. The container now sits proudly in the yard and stores garden tools and outdoor furniture. We put in a bench for repotting plants and doing other odd jobs. AND we’re making plans to build a roof-top garden on the flat roof. Given the density of housing here, a garden on an elevated roof will get more sun… which was the dream all along for having a container. 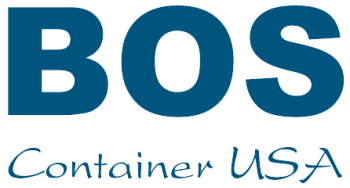 Thank you, Kari and BOS Container USA. We’re thrilled with having our own steel “shanty” for storage and to expand our vegetable garden ! "I would like to thank you for the prompt and courteous way that you have dealt with my company for the past year. By phone and email, and also by personal visits, TK Markets and BOS have helped me to grow my container rental, leasing, and sales business, and continue to help with customer leads and new marketing ideas. I also appreciate the quick and smooth delivery service I receive direct from the factory. I am looking forward to a long and successful business relationship with TK Markets/BOS." "Many, many thanks for your fast and efficient service! Not only did you provide me with all the information I required to start my new portable container sales and rental business, but you arranged the delivery promptly, as well. More good news was that my display was set up immediately upon unloading and I have been able to show my products and accept orders from the very first day onward. Since dealing with Tom and Kari, I have had extremely helpful and efficient service. It is not often in these days to find people who have the answers and who are also willing to help with installation, assembly, and provide marketing support and service after the sale is completed. I will always recommend TK Markets and BOS containers whenever I can."